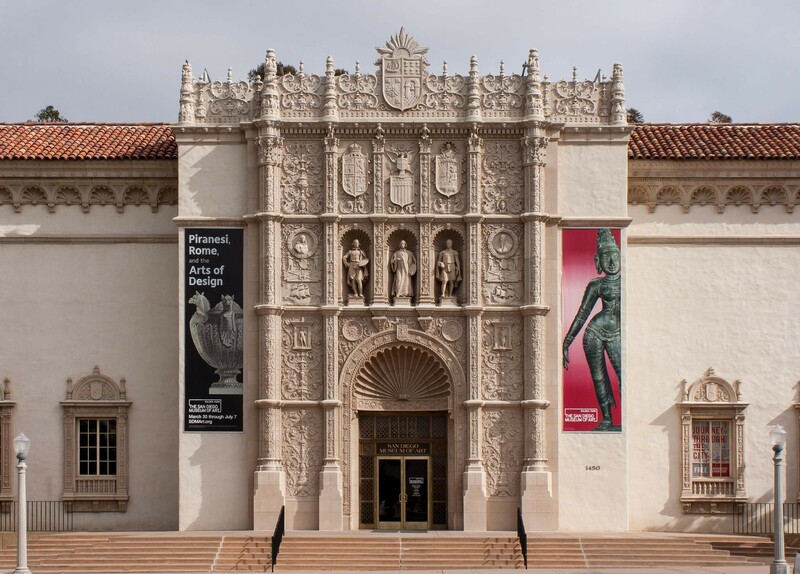 San Diego is beautiful and lively with so much to offer. 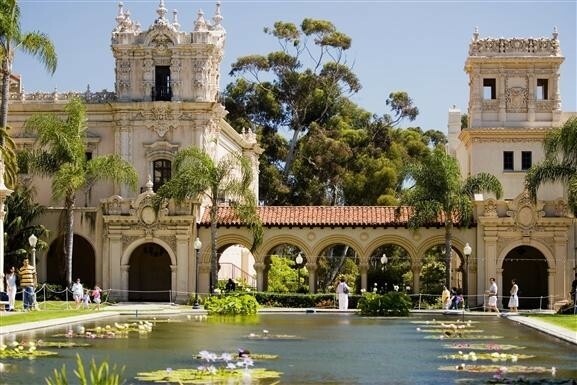 Gorgeous coastlines and scenic parks are just the beginning. Below are several highlights and points of interest you may wish to visit during your trip. 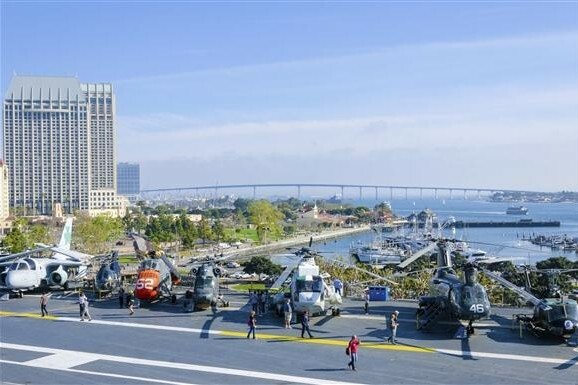 San Diego is a big military town. You'll likely see bases scattered about while exploring the city, especially around parts of the San Diego Bay. The USS Midway is one of these affiliated sites that offers an insider's look into what is normally closed off to the public. The USS Midway is the longest-serving American aircraft carrier of the 20th century, having played host to 225,000 sailors over the course of its life. This historical relic offers patrons the opportunity to explore 60 different exhibits and 29 restored aircraft aboard, including some that have flown in World War II, Operation Desert Storm and the Korean War. During the self-guided audio tour, you'll see the crew's sleeping quarters, the engine room, the ship's jail and the primary flight control room, among other areas of the 4-acre flight deck. There are also flight simulators, fo'c'sle knot tying demonstrations and a cafe when you start to feel peckish on-site. The southernmost tip of Point Loma is where you'll find the Cabrillo National Monument. The statue depicts Juan Rodriguez Cabrillo who, in 1542, was the first European explorer to navigate the Californian coast. Situated about 10 miles southwest of downtown San Diego, this monument is much more than just a memorializing effigy. The main reason people make the journey to the monument is its incredible views. 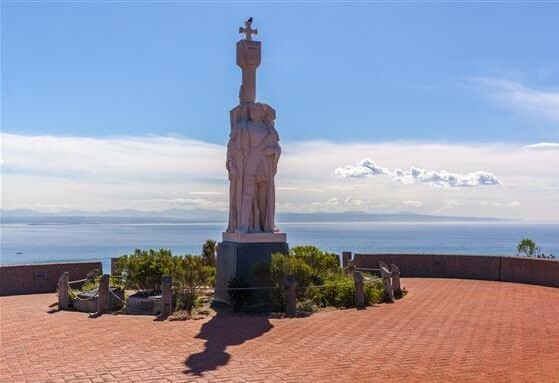 From the Cabrillo Monument, you can enjoy sweeping views of the Pacific as well as the Point Loma naval base below (where Cabrillo initially docked his ships), downtown San Diego, Coronado, and on a clear day, the mountains of Tijuana, Mexico. 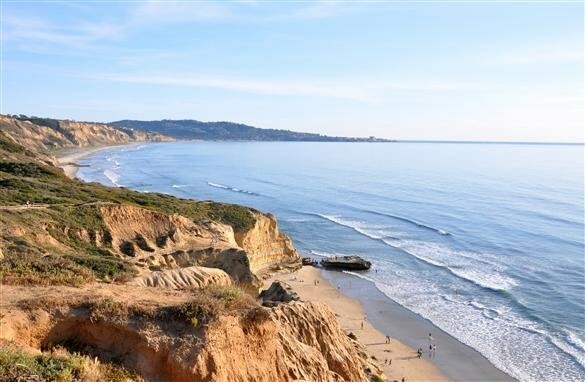 Once you've gotten your fill from the top, walk or drive down Cabrillo Road to experience the Point Loma Tide Pools (best experienced during the winter months), or take a scenic walk along the adjacent bluffs. There's also the 2.5-mile Bayside Trail that cascades down into the east side of the point and ends right above the bay waters. 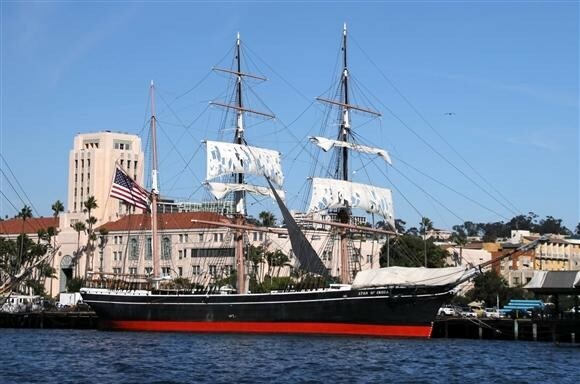 For those more interested in the historical aspect of the attraction, the NPS site features ranger-guided talks further explaining the story behind the Cabrillo Monument as well as the restored Old Point Loma Lighthouse, located a short walk south from the monument on Humphreys Road. 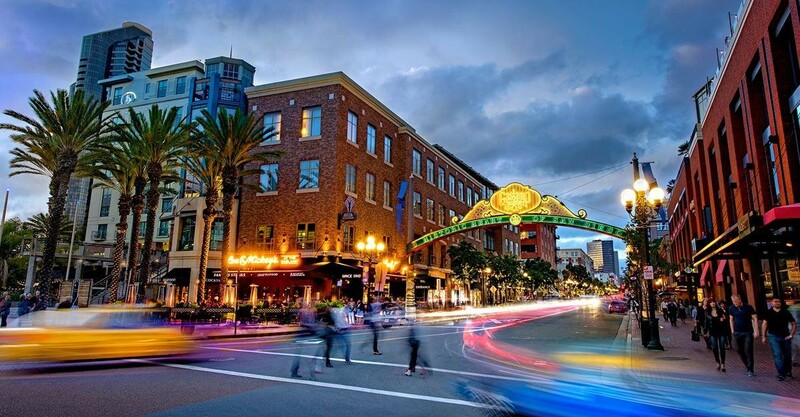 The Gaslamp Quarter's 16 blocks are peppered with Victorian-style buildings that now house a variety of shops, art galleries, theatres and trendy restaurants, not to mention plenty of bars and clubs. The area stretches from L Street all the way up to Broadway, including Sixth, Fifth and Fourth avenues as well as out to First Avenue at G Street. The best place to start your tour of the Gaslamp Quarter is the Horton Plaza outdoor shopping center, situated at First and G Street. From there, you can explore the neighborhood's side streets that will eventually lead you to the main avenues. Or you can start at the Gaslamp Quarter Gate itself, located at L Street and Fifth Avenue. Fifth Avenue is considered downtown San Diego's main thoroughfare. You'll find the most action here, especially at night. With all of its amenities, it's important to know that the Gaslamp Quarter is San Diego's premier nightlife destination. If you're not a night owl, another way to experience the Gaslamp Quarter's lively atmosphere is to take advantage of the patio seating offered at some of the neighborhood's restaurants, or venture to one of the many rooftop bars (Andaz San Diego in particular has fire pits and beds and lounge chairs for patrons to relax on). Though you may spot wildlife at any one of San Diego's beaches (especially Pacific and Mission Beach) none put on quite as good a show as the performers at SeaWorld. 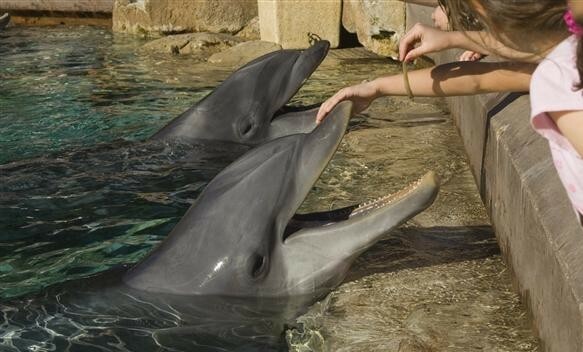 Here you'll get to see a range of animals, including dolphins, California sea lions, California otters and sea turtles, among others. As for the rides, travelers love the lightning fast Manta Ray rollercoaster, but caution against the Journey to Atlantis or Ship Wreck Rapids ride if you don't want to get wet. 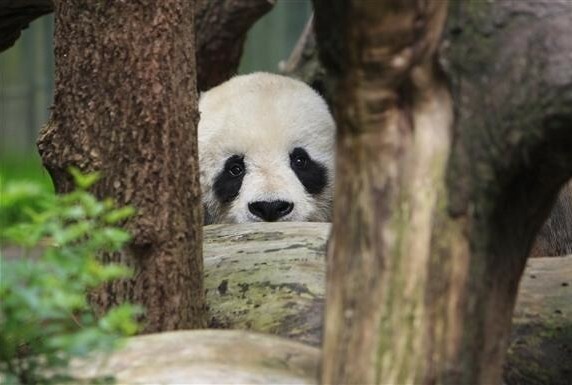 For something a little more low-key, head to any one of the park's animal exhibits, like the shark underwater viewing tunnel, the penguin habitat, which features nearly 300 penguins, or the vast Wild Arctic ride/exhibit, which features the chance to see beluga whales and polar bears. There's also the Sesame Street Bay of Play, which features various playgrounds wet and dry as well as arcade facilities and smaller mechanical rides for the really little ones. 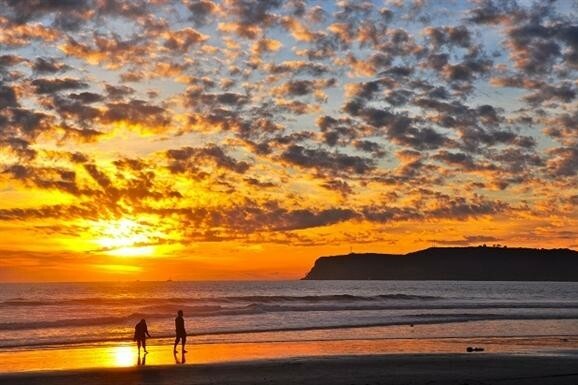 Mission Beach and Pacific Beach are one giant, connected shoreline in San Diego. 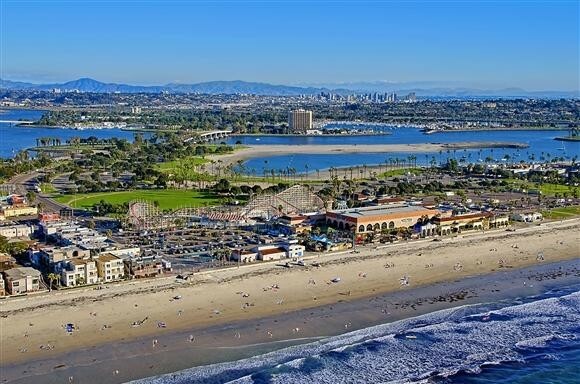 While not as pristine as Coronado Beach, the area is just as popular thanks to all the nearby attractions and amenities. This miles-long stretch of sand fits the SoCal stereotype to a T: throngs of surfers and bikini-clad sunbathers crowd the shores every summer, while the nearby boardwalk is usually packed with inline skaters and bicyclists. 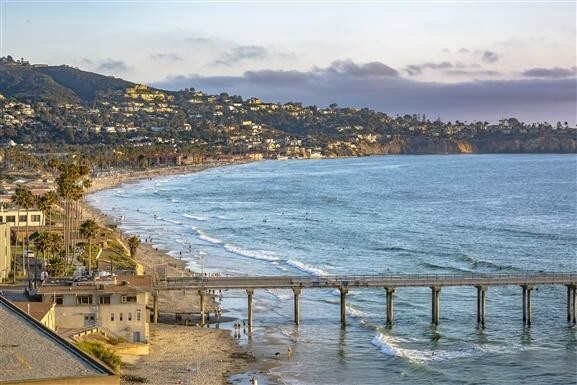 The beach is a popular spot in San Diego for surfing as well, offering swells both high and low, perfect for beginners and seasoned surfers (there are numerous water sports equipment rental shops strewn around the neighborhood). Belmont Park, which acts as the border between the two beaches, is a beachfront amusement park featuring arcades and numerous rides, including the Giant Dipper wooden roller coaster – a more than 100-year-old National Historic Landmark. 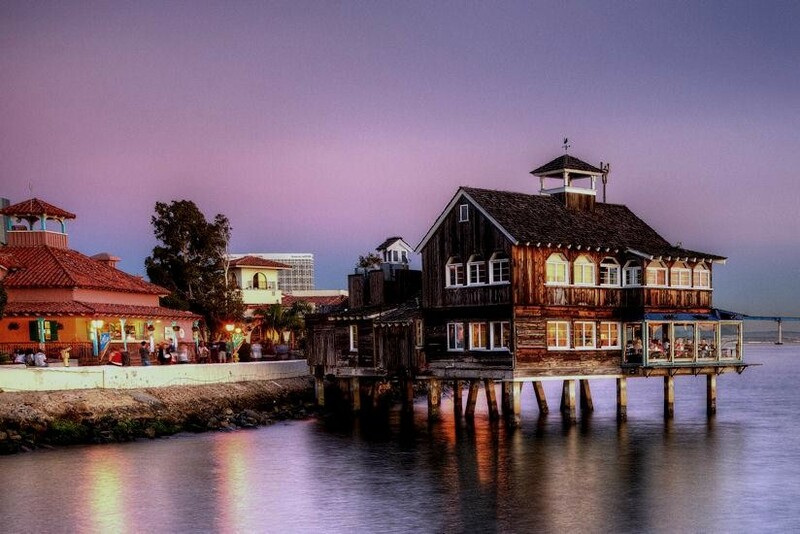 When lunchtime rolls around, head to one of the many beachside eateries that flank the boardwalk or Mission Boulevard (the area's main thoroughfare), or have a picnic at Bonita Cove, the bayfront park located across the street from Belmont Park. The difference between the two is discernible. While they both share the same boardwalk, sand and ocean, Pacific Beach and Mission Beach share key differences. Mission Beach, which begins at Belmont Park going south, is the calmer of the two. The boardwalk has more homes than hotels and far fewer amenities than Pacific Beach, making it good for families or those seeking a more relaxed beach experience. Pacific Beach, which starts north of Belmont Park, is much more lively. Mission Boulevard, the main thoroughfare, is lined with restaurants, surf shops, retail stores, hotels and bars. The further you go up Mission Boulevard the further you go into the belly of the beast that is Pacific Beach. Next to the Gaslamp Quarter, Pacific Beach is the best place for nightlife in San Diego, known for getting particularly rowdy. Aside from Mission Boulevard, you can find a heavy concentration of bars and nightlife options on Garnet Avenue and Grand Avenue. If you don't want to experience this side of Pacific Beach, take a walk along Crystal Pier or stick to the beach north of this pier. La Jolla Cove is the jewel of La Jolla. 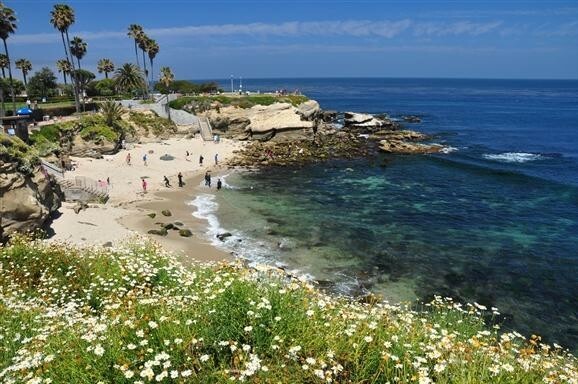 Located across the water from La Jolla Shores, La Jolla Cove may not be much in terms of a beach, but its striking beauty and snorkeling reputation more than make up for it among recent visitors. The site is an ecologically protected area that is home to vibrant wildlife both in and out of the water. In fact, it's not uncommon to spot sea lions hanging close to the cove's bluffs and tide pools. Oftentimes, they even come on the beach. This is also an excellent spot for beginner snorkelers. Advanced snorkelers should take advantage of the sea caves located along the bluffs, but only with a guide. If you aren't an advanced snorkeler but still want to see the caves, you can take a kayak tour, offered by La Jolla Sea Cave Kayaks, or visit the Cave Store, which is home to a manmade tunnel that goes directly inside the Sunny Jim Cave. Travelers say even if you don't plan on swimming or snorkeling, you should still visit the attraction for its picture-perfect setting. Visitors also recommended stopping at Ellen Browning Scripps Park (the park above the cove) for a picnic or a walk along the bluffs. Make sure to stop at the Children's Pool Beach along the way for even more wildlife viewing. While people are allowed to access the area for sunning and swimming, most don't since it's become a safe haven for sunbathing seals and sea lions. What's more, the water is also filled with sharp rocks and the area has strong currents due to the offshore reefs. The best way to experience Children's Pool is to walk along its seawall. 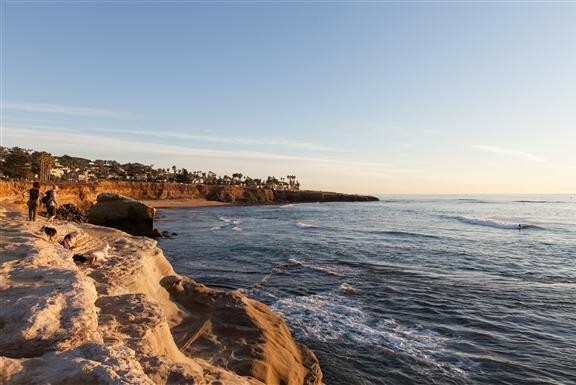 Known for its gentle waves and active beachgoers, La Jolla Shores is an ideal place to relax for a few hours. Locals and tourists hit this beach to surf, see marine life and enjoy the clean ocean water and sand. Families flock to La Jolla Shores and appreciate the reliable lifeguard presence and ample public restrooms. Adjacent to the beach is the La Jolla Underwater Park Ecological Reserve, which houses two artificial reefs meant to attract marine life. Its perimeter is marked with buoys to enforce the strict no fishing rules. Along with fishing, collecting seashells is prohibited, as the area is part of the Marine Life Refuge used by the Scripps Institute of Oceanography for research. Away from the protected refuge, surfers and boogie boarders come to catch waves in designated zones. Additionally, kayak and snorkeling gear rentals are available and visitors can sign up for scuba diving classes ahead of time. La Jolla Kayak and San Diego Bike and Kayak Tours are two companies that offer rental equipment. There are a handful of dining options where visitors can grab a quick bite or nice meal just a short walk from the shore. Travelers warn if you're bringing a cooler to watch out for hungry seagulls that will hover looking for food. For a prime vantage point, visitors suggest seeking out one of the rooftop decks at the local bars, where you can enjoy shoreline views and vibrant sunsets over cocktails.